Ambassador Nikki Haley, U.S. Permanent Representative to the United Nations, met with Ethiopian Prime Minister Hailemariam Desalegn today [23 October, 2017] in Addis Ababa, Ethiopia. 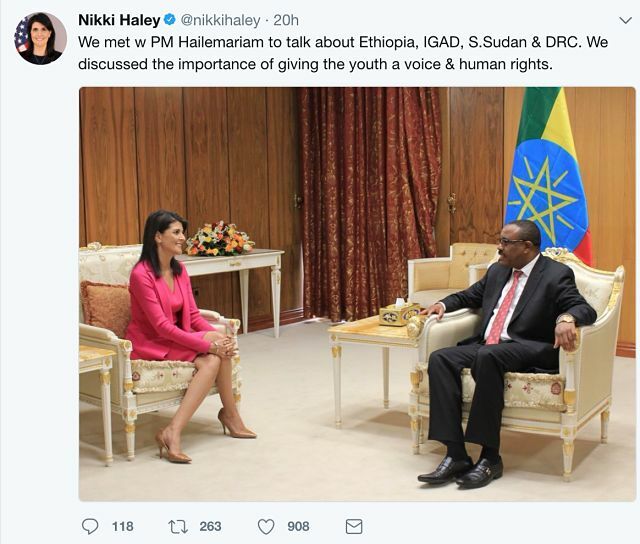 Ambassador Haley thanked Prime Minister Hailemariam for his country’s leadership in continuing to host desperate people fleeing conflict in the region and for Ethiopia’s decades-long generosity hosting refugees from nearby countries.